I once subscribed to the school of thought that marketing automation was lazy marketing. I thought it was depersonalized, spammy, and not the right way to do things. The way small businesses win the digital marketing game is through smart marketing automation. Today let’s define marketing automation and then talk about some of the tools that SMBs can and should leverage to automate the parts of your marketing that should be. Software platforms and technologies designed formarketing departments and organizations to more effectively market on multiple channels online (such as email, social media, websites, etc.) and automaterepetitive tasks. Basically, marketing automation lets you set up processes that work behind the scenes in your business to do tasks that you could do manually even though your time is better spent elsewhere. While I also subscribe to Paul Graham’s Do Things That Don’t Scale (until they are ready to scale), you have to learn over time when a task is taking too much time (or needs to be done when you’d rather not be working) and thus should be automated. Business owners already work way too many hours (trust me, I and my nerves know). When you’re running your business and doing a lot of tasks that should be automated instead, you are indispensable to your company which also means that you don’t have time for vacation (or feel like you can never take one), are forced to always be on and obsessively checking emails/social media/etc, and much more which means you have less time for your family/friends/self. It’s a vicious cycle that I am sure many of you know all too well. So how do you start to reclaim some of your time? Automation, and specifically marketing automation. And if you’re interested in my mindset about it, check out Can I Automate That? on Medium. Besides automating things in your personal life so that they happen on time (think: bills), you can also automate a lot of the processes around your marketing so that you have more time crafting the right messages and strategies to reach your potential audience. This is just the beginning list and today I am going to show you the tools that I use to automate a lot of the things I do on Credo to make the product and marketing work. Email marketing is one of the easiest channels to automate and one of the most important if you are running a product. Think about this: what happens if you don’t automate the sending of receipts, sending email communications between people you are connecting, or even the sending of errors that occur on your system to your email? And if you do any editorial email marketing (with drip campaigns and more), who wants to try to remember who has received a specific email or not? Basically, email marketing is almost impossible to do well without automation. So what do I use for email automation? There are very robust systems out there like InfusionSoft that you can investigate (and cost a lot of money) if you have informational products especially, but I stick for now with the tried and true MailChimp. Now let’s address the monkey in the room first. MailChimp recently did away with their dedicated triggered email service and moved it into their Automation and Transactional functionality within the main MailChimp service. These parts of the service are not free, but since when did you ever get exactly what you wanted for free? If it’s completely free, then the business likely won’t survive and you’ll have to go elsewhere. Because Credo is currently (as of May 2016) built on WordPress, I use different plugins such as GravityForms, GravityView, and their add-ons to automate adding and removing people from different lists and sending different emails based on what they’ve opened and clicked or not clicked. Depending on the platform your website is built on, this may or may not work as seamlessly for you (though it took a lot of configuration on my end), but it works well. Social media can be automated in a number of ways that make your life easier while still enabling a personal touch. While we are not a fan here at Credo of automated interaction on social media (such as automatically favoriting tweets on a specific hashtag), we are a fan of scheduling content to share throughout the day to keep your audience engaged and following you because of the value you bring. Here are a few ways to automate this. 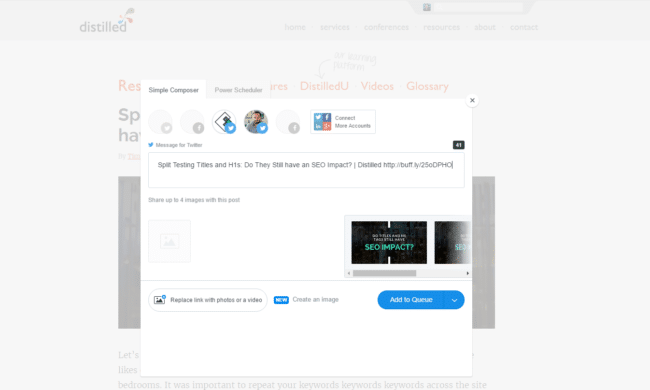 My general workflow around Buffer is to use the well-reviewed Chrome extension to add content to my Buffer queue as I come across it anywhere on the Internet – websites, Twitter, Facebook, etc. On the Awesome plan, you can connect multiple accounts and decide which ones should share that content. Within the app you can pick specific times during the day to have content shared as well. The Awesome plan is $10/mo. The individual plan is Free! In today’s day and age with modern Content Management Systems (CMS for the uninitiated), there is no reason to manually publish content on a schedule. That’s why we have automation! Any CMS worth its salt will enable you to publish content on a schedule. You never know when inspiration will strike, so why stress yourself to have a piece of content done by a specific time on a specific date? Instead, use your CMS’s scheduling function to specify when your content is released into the wild. One of the tenets of content marketing is to publish on a schedule. so use this to your advantage and schedule content as far out as possible. Remember, publishing on a schedule does not also preclude you from writing about breaking or newly relevant topics, but not scheduling content usually sets you up to not publish on a schedule. 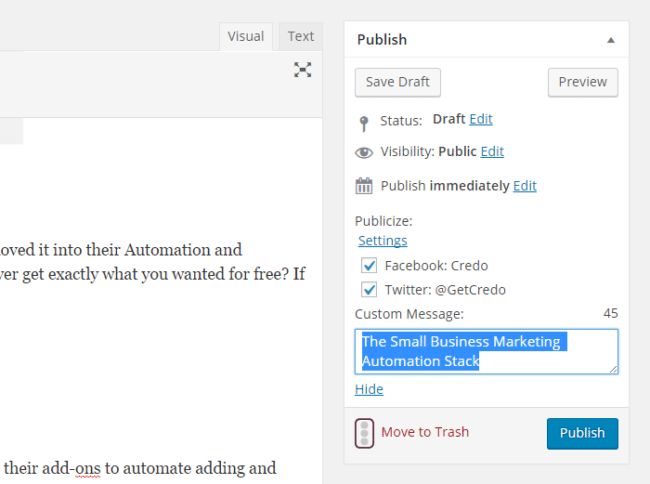 We have already talked about some of the ways to automate social media when new editorial content is published, but there are some other ways to automatically promote your content via plugins. Namely, think about RSS. You’re building an email list (you are, aren’t you?) and if you are publishing on a schedule (you are, aren’t you?) then this is a great way to communicate frequently with the people who have expressly noted that they want to receive updates when you publish new content. While I sometimes hate RSS (and killed it on my own site for a reason), it can still be very powerful. 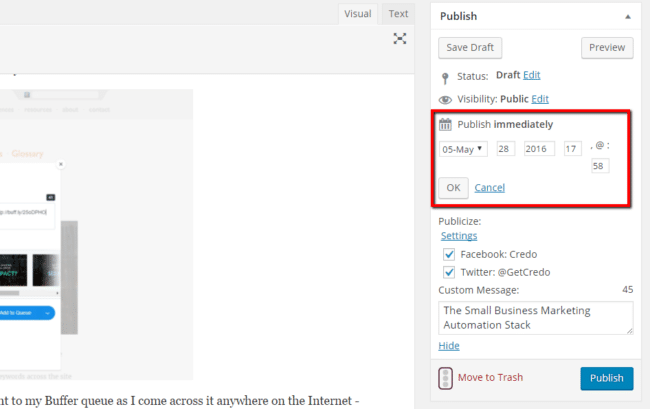 You can burn a feed on Feedburner and create an RSS-driven campaign in MailChimp. With an HTML template, you can automate sending RSS emails linking back to your site to your list every time that you publish. Because small businesses run lean in terms of the number of people employed, you have to implement processes for payment as well. Invoicing takes time and is sometimes unavoidable, but you would be remiss to ignore some of the great tools available to help you automate payments. Stripe is, in my opinion, one of the most amazing tools on the Internet. Just as Twilio revolutionized messaging via SMS and other means, Stripe is revolutionizing automatic payments online. Whether you have an ecommerce or subscription business, Stripe automates recurring subscriptions (we use it on Credo) and eliminates the need to manually process payments. Because after all, who has time for that amidst all the other things you need to do? They also integrate with services like TypeForm or GravityForms (WordPress), so you can take credit cards easily. Mega win! Marketing automation is hard. While tools like Hubspot and InfusionSoft exist to help with a lot of it, they came at a cost. If you want to, you can string together a pretty good marketing automation suite using the tools that I have mentioned here until you are ready to invest in a more robust system. What tools have you found that help you automate tasks in your marketing? Good insights and perspective, John. I have been thinking a lot about marketing automation tools lately such as InfusionSoft, Hubspot but the cost and time involved is substantial. I’m focusing on building up and improving systems more before taking on an expensive tool that won’t likely pay prompt dividends. As for tools I do use that weren’t mentioned, I use FreshBooks for recurring invoices, which is helpful. I am also considering testing out 17 Hats in the near future.